Bodo Territorial Council ( BTC ) on Tuesday distributed scooties to the meritorious girl students belonging to BPL families. Total 26 meritorious girl students belonging to BPL families and residents of Kokrajhar district were gets scooty at a ceremonial function held at Kokrajhar Girls College Auditorium hall here . BTC deputy chief Kampha Borgoyary attended the function as chief guest and gave away the keys to the meritorious girl students. 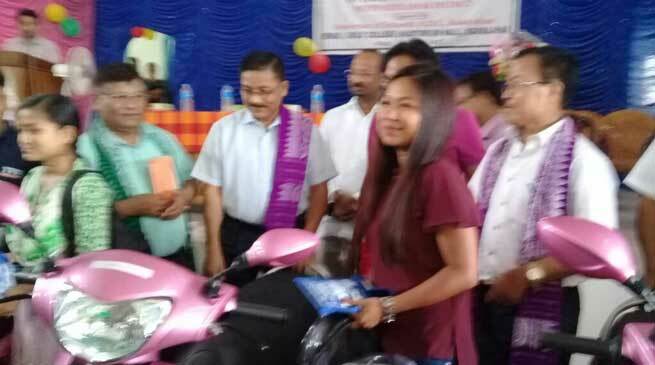 Altogether 88 girl’s students in the four BTAD, of which 26 in Udalguri, 19 in Baksa, 26 in Kokrajhar and 17 in Chirang will be given away the scooty. Borgoyary in his speech emphasized that the BTC government was trying to ensure all-round education by giving a boost to the infrastructure development of educational institutions. He said meritorious girl students belonging to BPL families were distributed the scooties. He said the scooty will enable the students to come to the classes without any problem. He urged the students to make the best use of the scooty.